WE CAN HELP YOU PROTECT YOUR INVESTMENT. IS THIS WHAT YOUR FENCE LOOKS LIKE? 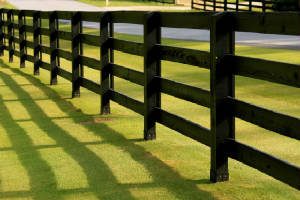 DID YOU JUST SPEND $3-$4,000.00, OR MORE, BUILDING A NEW FENCE? AND THEN SLOWLY CHEW IT UP WITH YOUR STRING WEED EATER, GRASS TRIMMER, STRING TRIMMER OR WEED WACKER. IF YOU ANSWERED "YES" THEN WE CAN HELP. 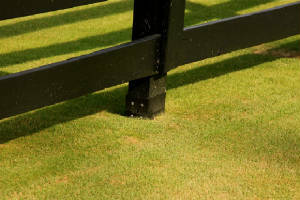 THERE ARE COUNTLESS NUMBERS OF FENCE PROTECTION COATINGS, PRESSURE TREATMENTS AND POST CAPS THAT PROTECT YOUR FENCE FROM MOTHER NATURE. BUT WHAT ABOUT THE ABUSE YOUR FENCE RECEIVES FROM YOU OR YOUR LANDSCAPER? ON GRASS CUTTING DAY YOU BRING OUT THE DREADED GAS, ELECTRIC OR BATTERY OPERATED WEED EATER, STRING TRIMMER, GRASS TRIMMER OR WEED WACKER AND PROCEED TO SLOWLY DESTROY YOUR FENCES' INTEGRITY ONE SPLINTER AT A TIME. EVENTUALLY THE PROTECTIVE COATING AND/OR THE PRESSURE TREATING HAS BEEN CHEWED AWAY SPLINTER BY SPLINTER. 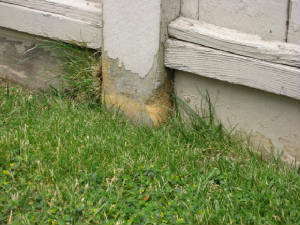 EVENTUALLY WATER WILL SOAK INTO THE RIPPED, LOOSE FIBRES AND PROCEED TO ROT YOUR FENCE RIGHT AT THE BASE. WE HAVE DEVELOPED A POST PROTECTOR THAT WILL PREVENT THIS FROM HAPPENING TO A NEW FENCE OR WILL PROTECT YOUR EXISTING FENCE FROM RECEIVING FURTHER DAMAGE. 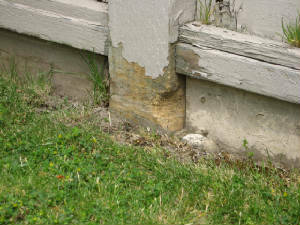 FOR DAMAGED POSTS, SIMPLY SEAL THE EXPOSED, SPLINTERED POST BASE WITH PAINT OR STAIN AND ATTACH OUR POST PROTECTOR. 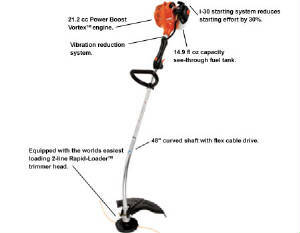 Improper use of any trimmer/brushcutter can cause serious or fatal injury. Read, understand and follow all safety instructions in your instruction manual. To reduce the risk of injury from blade contact, circular saw blades may be used on FS brushcutters that have a limitstop, a bicycle handle and double shoulder harness and not on FS brushcutters with a “J” handle or loop handle. Other rigid blades may be used on FS brushcutters having a bicycle handle, a “J” handle or a loop handle equipped with a barrier bar. To reduce the risk of eye injury always wear proper eye protection. Always use the appropriate deflector for the type of cutting attachment, as explained in your instruction manual. MAYBE THE TRIMMER MANUFACTURERS SHOULD WARN THE PURCHASER ABOUT THE DAMAGE THEY CAN CAUSE TO YOUR FENCE.